I am posting a bit early today as there are festivities this evening. A belated Halloween costume dance, I'm going as a haunted mime or a ghostly carny...or something like that. I am enjoying crossing the Atlantic thus far. It reminds me a bit of being in the desert, where you can see for miles and miles. This morning I watched the sunrise turn distant storm clouds pink. I stood on deck nine forward just watching the swells and enjoying the movement of the ship. I'm pretty sure it actually made the coffee taste better. Shortly after my drum practice this afternoon I saw flying fish. They have to be one of the strangest creatures I've ever seen. These are larger than the ones we saw off the coast of Africa and they 'fly' much further distances out of the water. We often see dolphins when they are near but I saw none today. I've yet to see a whale but I've been told that that may be more likely as we near the coast of South America. I am attempting to attach a photo to this post. I believe I made it small enough to send. 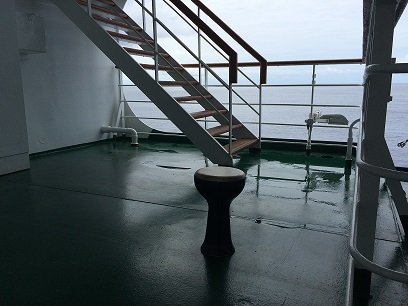 This is the spot on deck seven where I go to practice, to read or to just get away form the other 649 people on this ship. Out side of the crew, no one comes here other than me or at least I've never seen anyone other than crew here. You can't lay in the sun and there are no chairs or tables. It is one of the few peaceful locations on board. I may be jinxing myself but I really hope it stays that way. Thus far the majority of my favorite moments has been while we are at sea. I love being on the ocean. I sleep better when we are not in port. Even when the weather is rough, which thankfully has not been much beyond the first few days when we were in the midst of a storm, I'd often rather be here than on land. I understand the appeal of living on board a boat...learning to sail will be even higher on my list now.